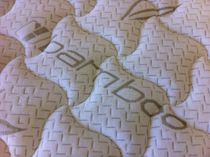 In this mattress we offer a 6" full Talalay blended latex core or all natural dunlop, beautiful bamboo quilted stretch knit fabric, with 1.5" of Pure Joma Wool quilt on each side to prevent impressions. 20 year limited warranty. 10 year non pro-rated, 10 year pro-rated. We roll and compress this item for UPS shipping.